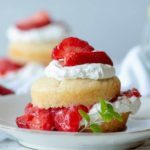 This guilt-free strawberry shortcake is incredibly tasty, fluffy and light! It's low carb and keto friendly with only 7.3 carbs. In a mixing bowl, whisk together your wet cake ingredients. Stir in your almond flour and baking powder. Bake at 350 for approx 25 minutes. Let the cakes cool while you whip up your heavy cream, sugar substitute and vanilla. Whip to stiff peaks. Place one cake on a plate. Cover the top of the cake with whipped cream. Then add a layer of strawberries. Place the second cake on top and repeat – cover with whipped cream and then more strawberries.